Last night, Cherwell District Council adopted the Co-operative Party Charter Against Modern Slavery. What makes this unique, is that Cherwell has been Conservative-led for more than two decades. Despite this, the Labour Opposition, which I have the privilege to lead, was able to achieve unanimous support for the move. We started by laying the groundwork early. I am fortunate to have a monthly column in each of the local papers for the two main towns in the district; the Banbury Guardian and Bicester Advertiser. 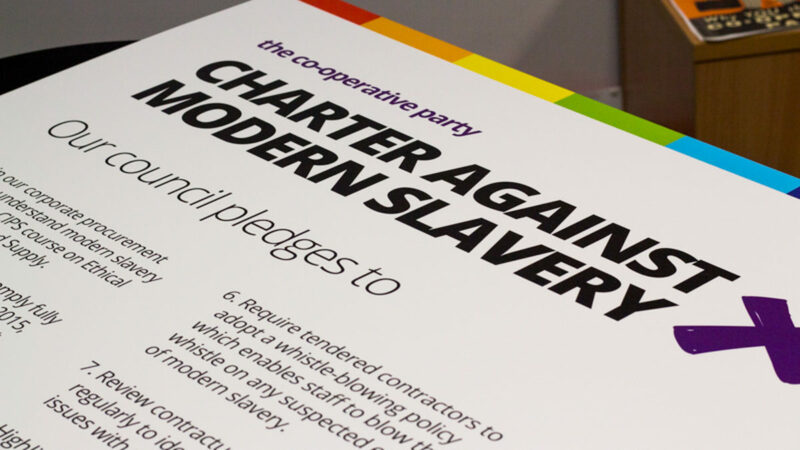 Immediately before the council meeting, this column was devoted to explaining the issue of Modern Slavery and what the Co-operative Party’s Charter was about. Equally important was to point out its local relevance. Recent arrests in Oxford and statements about the crime’s pervasiveness in the county by the local Police & Crime Commissioner helped. That set the agenda for the meeting. The next step was having an ear open to those from the Conservative ranks who might want to make amendment – few administrations are likely to accept an opposition motion unamended. We were prepared to be flexible, but we didn’t want to see the Charter’s main points diluted. We accepted two amendments. The first acknowledged the issue of support for victims without explicitly calling for Government to extend the support offered, whilst the other included a line which I think has been missed in much of the discussion about Modern Slavery. The second introduced a line recognising Forced Marriage as a form of Modern Slavery and committing to work with local police in tackling it. Given that this amendment clearly sought to strengthen, not dilute the motion, I accepted this very happily. Finally, we got to the meeting itself. Having accepted the amendments we came to the speeches. In addressing council I did not shy away from pronouncing where this motion came from. I repeated that it was straight from the Co-operative Party Charter. No attempt at pulling the wool over anyone’s eyes was made. I appealed to the party opposite’s patriotism by speaking about Britain’s proud history of opposing slavery since the Act that William Wilberforce brought into being in 1807. I spoke of the potential for the council to accidentally fund slavery if it failed to do some of the things in the charter. Finally I spoke of the common values inherent in the charter which the entire chamber could embrace. As the first Conservative councillor began to speak, it became clear quickly that we were going to get this through and probably unanimously. I have never felt more proud. Cherwell currently has 36 Conservative Councillors. I lead a Labour Group of 9 on the council. If we can get the Charter through in opposition, I know others can too.